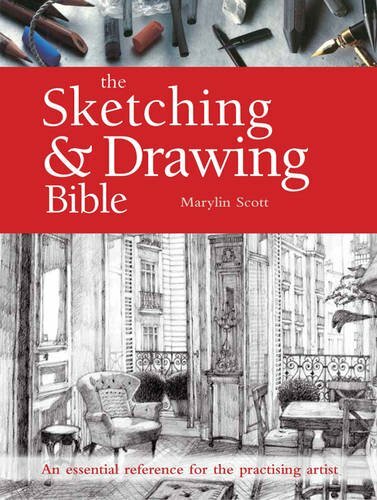 The Sketching & Drawing Bible by Marylin Scott is like one of the many other books out there that talks about art techniques, materials and things you can draw. There are three sections to the book. The first talks about drawing tools, second is about techniques and last on subjects. This book is more like a guide to the different techniques that artists use to create their art. E.g. They can use pencils for shading or hatching, markers for layering, creating art with mixed media techniques. It doesn't talk about the thought that goes behind the drawing. E.g When you are shading, it's because you want to capture light and shadow to present the form clearly. This book doesn't explain that and most of the instruction goes into describing the techniques, such as how you can press harder to get darker tones. It's missing the why. This book works better as a compliment to an instructional book that actually teaches you how to draw. What I like about the book are there are many beautiful examples. You can get many ideas on experimenting with different medium.